***One single warning – DON’T DRINK THE WATER or HAVE ANYTHING MADE FROM THE WATER ie. MOCHA FRAPPICCINO. Monday night began my 72+ hours of hell in China. In some Mexico it is called Montezuma’s Revenge, I’m not exactly what it is called in China, but I call it General Pao’s Revenge, and it isn’t fun. If you read my article on Shanghai, I noted not to drink frozen drinks while in China. I made the mistake of having a Coke with ice, 2 Icee’s, a Dairy Queen frozen drink, and a Mocha Frappuccino from Starbucks. In China, you must only drink water from sealed bottles and no ice. My mistake nearly caused me to miss going to the Great Wall of China. After arriving at the Beijing airport on Tuesday, we picked up our bags and caught a cab to our hotel. The Park Plaza Hotel Beijing Wangfujing doesn’t have the most obvious entrance, but after our cab driver (who by the way had on a shirt that said “Bilingual Cab Driver” and wasn’t-at least not English anyway) asked a security guard found it. We checked in and decided to upgrade the room so that we could get free buffet breakfast. In Shanghai this wasn’t necessary as there were plenty of places to eat close by. Although probably not necessary here, with my stomach feeling the way it does, I didn’t want to exert the effort and looking back, I’m glad we did this. The room was nice and business-like and modern, however a bit small, especially the bathroom. There’s a large desk perfect for working and flat-screened TV with a multitude of English channels such as HBO and CNN International. This room is aimed at the business professional in every way down to the hotel’s location. It is situated near the Metro as well as steps from Food Road. Not feeling the wares of Food Road, we stopped in a Cantonese restaurant, Lei Garden, near our hotel, as recommended by Fodor’s Guide. I think things have changed since it was written as this place wasn’t as described. We were first asked if we had reservations and then a big deal was made to get us a table. At best they spoke partial broken English and the host even asked if she could speak Chinese to me (she could but I wouldn’t understand it). We were told we could eat there but would have to be finished in an hour so that the people that had reservations could have our table. The food was delicious and the service impeccable. If you plan to visit this very reasonably priced restaurant, I recommend reservations (and some Chinese language skills). Once complete, we returned to the hotel for the happy hour, free drinks and snacks until 7:30pm. Wednesday we strolled over to Tian’anmen Square. A longer walk than expected, it was made pleasant by a quiet stroll through the Imperial Wall Ruins Park. Once over near Tian’anmen Square, you must pass through security before entering the square. Like in Shanghai, the bag x-ray scans are efficient and quick even with all of the people passing through. One wonders if it is only for show. An immense square, it is surrounded by the National Museum of China, The Great Hall of the People, and the Mao Zedong Memorial Hall. Each building’s architectural style dated from its communist era with very little ornamentation. The square is swarming with visitors and on a hot day you would find little or no shade. It is a non-descript area that allows for a quick visit in my opinion. According to the website, the Imperial Palace is also known as the Forbidden City. Its construction was prepared since 1406 and completed in 1420. The period was in the reign of the third Ming emperor Yongle, whose name is Zhu Di. After the downfall of the Ming, the Palace remained to be the imperial residence of the Qing dynasty until 1924, when the last emperor Puyi was forced to leave the Palace 12 years after his abdication. From the completion of its construction in 1420 to the downfall of the Qing dynasty in 1911, altogether 24 emperors lived and ruled there. During these 491 years, the Imperial Palace had been strictly forbidden to the general public, in whose hearts it was very sacred and mysterious. The Forbidden City is much larger than what you might think just from walking in to the massive complex. The yellow glazed tiled roof, a symbol or royalty, glisten in the sun. More than 800 buildings and 8000 rooms, this historical site could take you all day, or even multiple days to see it all. If you don’t have enough time for that you can go to the Forbidden City website and download a “one day tour” with a map. Tour books such as Fodor’s also have recommended tours. Getting tickets is isn’t the easiest to figure out. Each complex is separated with a foot thick gate. The first opens up into a giant courtyard where you may see a ticket booth to your left. Actually there are two. These are the ticket booths to enter the side pavilions. Once inside, we again were asked if we’d have our pictures taken with a group of Chinese girls. Being very flattered, we obliged with a smile. Continuing on through the next gate, you can hop in line and wait your turn to pay your Y60 to enter the City. In this massive maze of rooms and royals halls you’ll see temples, and museums containing ancient scrolls, treasures, paintings, and clocks. Once you exit, be prepared to be inundated by street vendors selling their wares, it resembles bees swarming. Once you exit the complex you can continue on across the road to Jingshan Park that costs Y2.00 to enter. Here you can climb what seems to be 200-300 steps to the top of a hill capped by a Buddhist temple. The climb is worth the payoff view you get. At the top you get panoramic views of the city but more over, you get a true view of how large a complex the Forbidden City really is. It is breathtaking and gives you a sense of the true grandeur of this palace. choices we made the entire trip. Our guide, Jet was amazing. Knowing that it was a holiday, he requested that we begin earlier so that we wouldn’t be stuck in traffic all day- great recommendation. He met us in our hotel promptly at 7:30am with a smile and after our introductions, we were off. As we made our way to the highway, he explained different aspects of the city and even pointed out the condominium that he lived in as we passed by. He has been a qualified tour guide in Beijing for many years. He studied for one year in a travel and tourism course in London, and stayed in London for two years working with several travel companies as a guide. He now has his own tour guide business ChinaMango. We chose to go to the Mutianyu area of the Great Wall. We chose this area because it is significantly less crowded than other areas. You also can take a chair lift up to the wall (or hike if you’re up for the fit challenge and have the time) and once you’re done hiking the wall, you can take a toboggan ride back down which was so very much fun. As one of the best-preserved parts of the Great Wall, the Mutianyu section of the Great Wall used to serve as the northern barrier defending the capital and the imperial tombs. pass was built in the wall. In 1569, the Mutianyu Great Wall was rebuilt and till today most parts of it are well preserved. The Mutianyu Great Wall has the largest construction scale and best quality among all sections of Great Wall. Jet, our guide, realized that we had read about this area and its history so he didn’t waste time going back over it. Instead, we chatted about some specifics of the Wall as well as more personal things such as what it is like to live in China and general ways of life here. We shared a bit more personal stories and it wasn’t long before we were speaking as if we had known each other for a much longer time. Jet took us down steps and up steps and down steps and up steps. The Wall isn’t for the handicapped, not one single bit. Quite honestly, it is exhausting. Leaving early as we did, we arrived before many of the tourists and it was fairly quiet and even with the early morning mist, very scenic. He was very right about recommending to us to leave early to beat traffic and the tour busses. Once we had completed our hike on the Great Wall of China, we enjoyed the toboggan ride back down. This is one of the funniest things we did and I can highly recommend this to anyone visiting The Wall. We then drove over to the Ming Tombs. On the way Jet took us through the winding mountain roads through the local villages. At various points we saw how local’s lived; where people were harvesting the local chestnut crop and then roasting them and selling them on the side of the road. Grove after grove of chestnut trees lined either side of the two land road only delineated by fresh peach trees or apple trees. why the valley was chosen for these 13 tombs, information about the emperors buried here and even about the eunuchs and the gay emperor. The very nice thing about having Jet as a guide was that we weren’t taken to a “tourists trap souvenir shop” where we would waste our time and money like the rest of the tour groups/guides do. They make lots of commission doing that and although you may pay a bit more for Jet, he doesn’t waste your time. If you are hungry, you can stop and eat between the two sites but we chose to wait until we returned to the city (easier to point at what you want on the menu). A wonderful day complete, we again had our nightcap at the hotel’s free happy hour and returned to the room to rest and watch a bit of TV before falling to sleep exhausted. Saturday was once again a foggy, misty day but quite comfortable. We soon realized it is the city’s infamous smog it is so known for. Although it doesn’t make for the best site-seeing, we never have expectations so we’re usually not disappointed. After breakfast we set off to the metro to catch a number of trains to get to The Summer Palace. We purchased our all access pass and entering the grounds, you first notice how clean a park it really is. As in many other parks in the city, this one is filled with different types of pine. Throughout our time in China, we’ve seen very few birds or wildlife. Here in this park we finally saw a giant bird that looked similar to a blue-jay. As you make your way down the path among the throngs of people, you first come to a bridge. Below the stone arched bridge, there are a plethora of shops to buy souvenirs if you wish that line either side of the water. They have the typical things you will find all over the city and very little here is unique. There is however gondola type boats that can be rented. Although picturesque, walking around the lower area costs extra unless you buy the all access pass and it is aimed at tourists and could be skipped. Continuing walking, you enter a woodland area that moves up a steep hill with various small temples invite you wander, sit and admire, or just rest up from the climb. On the opposite side is a large lake with views reminiscent of an old oil painting depicting old sailing boats in an early morning mist. To get to the Summer Palace, you walk down the Long Corridor and then you finally begin seeing bits of the royal yellow roof peering out of the trees. Once you pass through the first gate, you soon realize how massive this palace was. It is gorgeous and probably one of the best kept tourist sites available. And once again, there are what seem to be hundreds of steps to climb to ascend to the upper level of the palace where you have the best views of the lake. I see a gentleman helping an elder Chinese woman up the steps and think to myself, “If she can do it, I can to.” Once atop this mountain of steps you have the most spectacular view that I saw in China, other than The Great Wall. If you visit the Summer Palace, you can expect it to take you around two or three hours if you wander the grounds and truly take in the beauty. fake iPhones and iPads, USB memory devices and so much more. Once we completed seeing this building we chose to head across the street to the other. The ugly step-child of the other building, this one contained more used equipment (or junk sometimes), as well as a lot of surveillance devices, copiers, software, etc. On the top floor was a “food court” however it was all in Chinese and all Chinese food. We returned to our hotel to relax after such a busy day and then had dinner at a Cantonese restaurant behind the hotel called Sunshine Kitchen. It was a restaurant with great food and even better prices. Menus were bilingual and they had food for the adventurous to the sublime. We awoke the next morning and had our breakfast. The hotel fills up a bit more on weekends as well as the dining room for breakfast. either side. Viewing only from the outside in of course another line of people, the inside is ornately decorated in colors of red, blue and gold. Another attraction is the Echo Wall where two people can stand on opposite sides of the large round complex and speak in normal tone and carry on a conversation almost. Quite fascinating and the many children testing this also thought so. In the park you may see a group of Chinese “line dancers” or people moving to music with long streamers. Walking the grounds on our way to the exit, we walked through the gorgeous rose garden. The garden had so many colors, types and sizes of roses that it was a kaleidoscope view for the eyes. The scent of rose permeated the air and it just made us smile. It was such a relaxing and happy end to this attraction. The next task on the list was to head over to the Hongqiao Pearl Market and pick up our souvenirs that we had been putting off buying. A multi-level building, it is a market with everything from pearls to hand bags. You can find oriental fans and scrolls, “jade” Buddha’s and fake iPhones and iPads and watches. It has so much that this is also a major stop for many of the tour companies and so outside you’ll see many large tour busses. If you’re not a shopper, this place isn’t for you. If you don’t want to partake in the bartering, there’s a nice little sandwich shop outside that serves beers and soft drinks. On the top floor are the more reputable jewelry shops albeit with higher prices like Fanghua Pearls. Once you purchase a strand of pearls, you can watch your sales person string them in to a gorgeous pearl necklace right before your eyes. with exotic foods such as scorpions, grub worms, and starfish on a stick to your typical watches, handbags and other souvenirs. 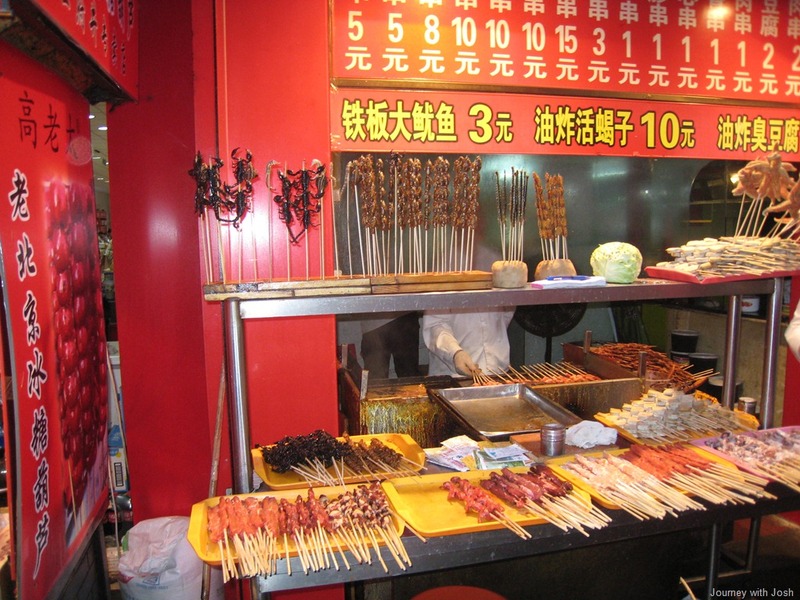 The worst thing I saw was at the food stands were not only the grilled bugs I mentioned earlier but also grilled baby chicks before the feathers began to grow, skewered on a stick. YUCK! We then went to McDonald’s and grabbed a bite and once it was dark we made our way over to Olympic Park. After exiting the station, we eventually found our way to the stadium area where you can view the Bird’s Nest Stadium and the blue Water Cube aquatic center. A true park area, the citizens of Beijing are still using this area two years after the Olympics for inline speed skating competitions. The area bustles with life like all other areas of this city that I have seen. After taking all of the photos and video I wanted, we wandered back to the subway station and caught a train back to our hotel before it stopped running around 11pm. Once back to the room it was time to finish up our packing for our return trip home. It would be nice to have 10+ hours on the plane to actually REST.